What's the spatial partition pattern? This may work if you have a few enemies, but what if you have an entire battlefield with several friendly soldiers and enemies? Then for each friendly soldier you have to search through the list of all enemies. If you have 100 friendly soldiers, then you would have to repeat the above calculation 100 times. 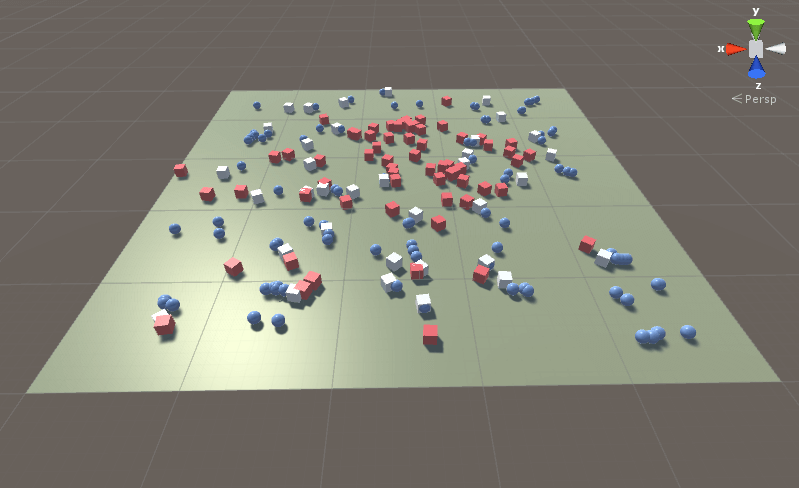 A better way is to store all enemies in a spatial data structure that organizes the objects by their positions. You can store both moving gameobjects, but also static geometry like obstacles in such a structure. A common way is to divide the area into a 2D grid and then you associate each cell with the enemies in it. Then to find the closest enemy, you have to figure out which cell you are standing in to get the enemies in that cell, and then you just figure out which of those enemies in the cell is the closest enemy. You also need a sphere and a cube, and they should be prefabs. You also need different materials. The reason is that we are going to change the cubes's materials to detect which of them is the closest. You will notice that the spheres are not always chasing cubes if there's not a cube within their cell. That's a nice side-effect, so you could maybe use the script to make patrolling gameobjects.